Have you been pondering the ideal gift for your hunter in the family? You may have considered a leather photo album to accommodate all of those treasured memories from his or her favorite hunting trips. 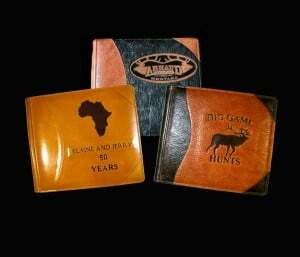 Hunting photo albums make the perfect gift for hunting enthusiasts. We will be happy to work with you to craft the perfect personalized photo portfolio to accommodate all of your hunter's special memories. Please feel free to give us a call anytime to discuss how we may craft a custom album for you. You may browse our website to view our selection custom guest books, personalized photo envelopes, leather wine totes, and photography portfolios. Keep in mind that each product is custom crafted for each customer. We will craft your selection from the leather, and finish of your choice. We often receive orders from people returning from safari, fishing, or hunting trips, or the spouse of an avid hunter seeking an album or portfolio book appropriate for their special photographic memories. If you’re looking for an album designed and crafted specifically to commemorate your activities, we will build it for you. We begin with an album constructed of leathers that you choose, and help you to develop a cover theme for your personalized photo portfolio that accommodates your particular wishes. We can inlay animals, names, places, dates, or whatever you like on the front of your custom made photo album. Please feel free to contact us to discuss our handmade leather photo albums.